Happy Monday! 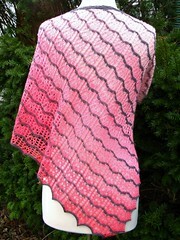 Time to look back at the previous week’s recently added knitting patterns on Ravelry and pick a few favorites. This sweater is mostly-ribbed, with a bit of cabling towards the top with a big cowl neck. This sweater made it into my (ever-growing) queue, because I think it has potential to look good on many body types. The cabling will draw the eye upwards, and the ribbing will make the body and sleeves accommodating. It’s worked mostly in the round — my favorite! I don’t have a good, simple sweater right now … maybe I should start this one sooner rather than later? Simple, attractive, fingerless mitts — no fancy colorwork or cables, no girly lace. Yet, with just a few purl rows in a contrasting color, these mitts look great! Endless color possibilities — they could be a real stash-buster for sock yarn. The pattern says they are designed to wear as-is, or over a wrist-brace for carpal tunnel or other RSI issues. Although I adore this sweater for many reasons — the top-down construction! the button detail on the sleeve! the awesome pleated panel on the back! — I have a sinking feeling that adorable as it is, it just wouldn’ t work with my body type. Alas!